Nissin Food Product Co., Ltd. (president: Koki Ando) has signed an endorsement and patch contract with professional tennis player Kei Nishikori on Sunday, September 28th, 2008. Nishikori will wear the “CupNoodles” logo on his adidas shirt starting Monday, September 29th during the AIG Open, at the Ariake Coliseum in Tokyo, Japan. 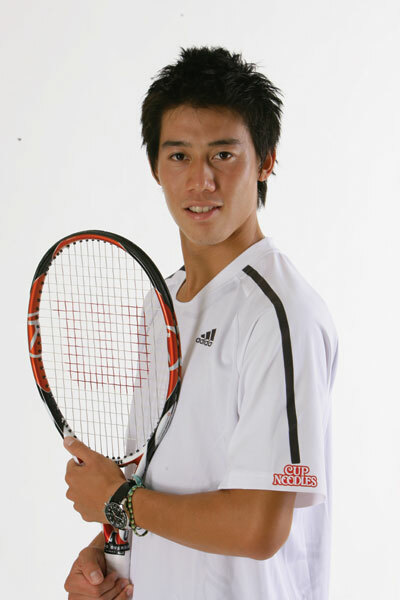 Kei Nishikori was described as “a genius” by Shuzo Matsuoka when he was still in elementary school and in the 8th grade he moved to the United States to join the Nick Bollettieri Tennis Academy. Nishikori has been training at the IMG/Bollettieri Tennis Academy where top players such as Agassi, Courier, Seles, and Sharapova were developed. Nishikori is now the youngest player ranked inside the top 100 in the world on the ATP Rankings. Just recently at the US Open, one of the four Grand Slams, Nishikori beat #4 in the world David Ferrer and reached the 4th round. This was the first time in 71 years that a Japanese male player reached the 4th round at the US Open. Nishikori’s explosive style of tennis and jumping forehand resulted in the media calling Nishikori “Air-K” and media requests for Nishikori have increased dramatically since the US Open. Nissin Food Products Co., Ltd. has supported many different athletes and sports over the years based on the philosophy that “Food and Sports are the supporting wheels for a healthy lifestyle”. This year is the 50th anniversary of Nissin Food Products Co., LTD and its decision to support Nishikori was based on the fact that Nishikori continues to grow and improve every day. This coincides with the company spirit of Nissin.